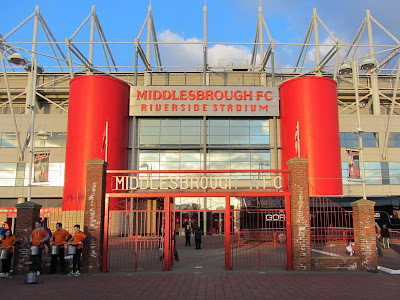 My ninth stadium of 2013 was on Tuesday 2nd April at the Riverside Stadium in Middlesbrough, North Yorkshire. The match was Middlesbrough vs. Peterborough United in the Football League Championship. The Riverside Stadium is located on the banks of the River Tees in an area in the north of the town which has seen much development over the past 20 years. Middlesbrough railway station is just under a mile from the ground. The venue has been home to the club since 1995 when they left their town centre home at Ayresome Park where they had played since 1903. When the ground was built the West Stand stood separate from the other three stands as the largest in the ground. This stand contains most of the club's facilities including reception area, ticket office, club shop and player dressing rooms. The stadium's executive boxes also sit in between the upper and lower tiers inside the ground. Outside the front of the stand sits the original gate entrance to their previous Ayresome Park home as well as statues of former players George Hardwick and Wilf Mannion. A few years after moving into the venue the north-west and south-west corners were filled in to join the West Stand up with the already linked remaining stands. This turned the stadium into a bowl, although the larger West Stand gives it an unbalanced appearance. This took the ground to a total capacity of just under 35,000 which is easily enough for Middlesbrough's current attendances. The game was a drab encounter which always looked likely to end goalless. Middlesbrough dominated the first half with Peterborough having to be content with the odd counter-attacks. The visitors did however have the best opportunity of the opening 45 minutes when Joe Newell ran untracked into the box and with just the keeper to beat shot wide. Middlesbrough had a number of half-chances but the away defence was well-organised and closed down the home side pretty effectively. The main outlet for Middlesbrough was Sammy Ameobi who danced his way through the Peterborough defence on a number of occasions but his final ball was often wide of the mark leading to the attacks breaking down. The second half was marginally better to watch, Peterborough's best go at scoring was just after the hour-mark when the ball reached Mark Little a few yards from goal. With Little unable to control the ball his scuffed shot was easily handled by Jason Steele. Middlesbrough bossed the final 20 minutes and Grant Leadbitter's rasping 25-yard effort very nearly found the back of the net. 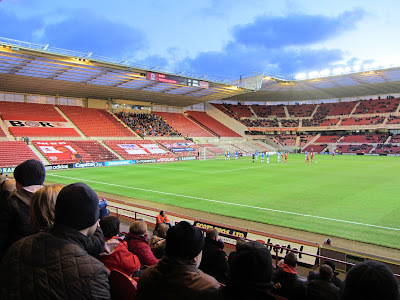 This period of Middlesbrough did not amount to anything though and to the home side's frustration the final whistle went with the teams tied at 0-0.